James and Eugenia, our fictional couple with exceptionally good taste in furniture, have just moved to Chicago! They have a long but wide hallway in their new place that they’re setting up as a mini-library. 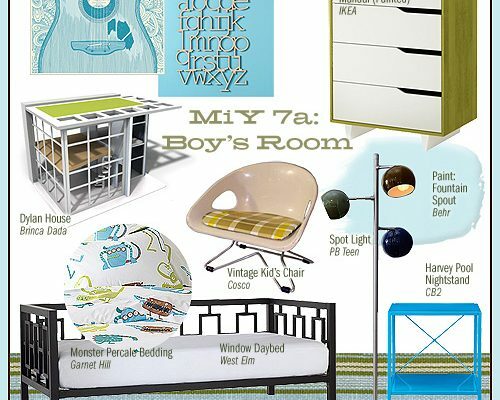 They don’t have a ton of space, so the small scale of the mid-century rocker chair is perfect for a little reading nook. Bookshelves with glass doors line the wall (the same bookshelves we have in our hallway library), and a glossy black floor lamp illuminates the area. The walls are painted a charming blue-green, and there isn’t enough room for a full rug but a graphic black and white runner works perfectly here. The apartment has a nice lived-in feel, so books are always scattered on the little side tables along with a few coffee mugs that hadn’t made their way to the kitchen yet. Eugenia also likes to keep a blanket (in orange, James’ favorite color) over the arm of the chair in case she gets cold. James and Eugenia have a spare room that they thought they’d setup as an office, but it looks like they’ll be turning it into a nursery instead! 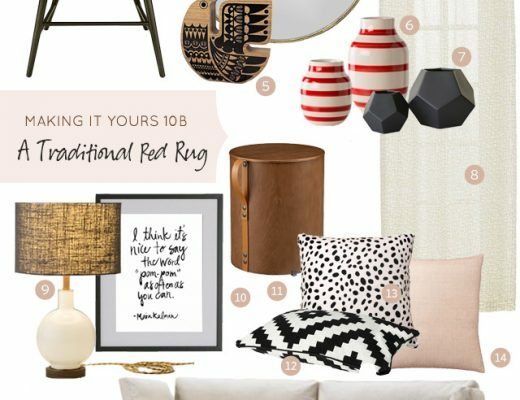 We’ll see that room next time in the final look for this edition of Making it Yours. I’ve always adored those Pantone mugs. They’re just so great. I am a little concerned that James and Eugenia are moving way too fast in this relationship…however their apartment is fabulous! Love the side table. I had a problem with that Kulla floor lamp, though. Mine kept making this buzzing noise so I took it back. It is beautiful, though!! I have the billy bookcases and they are awesome. The glass doors are KEY. People are always really surprised they are from Ikea. Ah, I love those Pantone mugs. Awesome. Those tables are lovely too. Found a little hallway table that somebody put out as trash last week. Will sand it down and paint it first, but it was a really nice little thing. I love this look! And I wish I had a hallway like that to set up as a reading nook. I’ve always loved the nerdiness of the Pantone mugs, and that rocker is just rad! Nicole, this is totally unrelated to james and Eugenia, but I know you adore red and I just had a mani/pedi with the best shade of nail polish I have seen in years. It’s OPI “Vodka and Caviar” Very candy-apple w/ 2 coats! WOW! 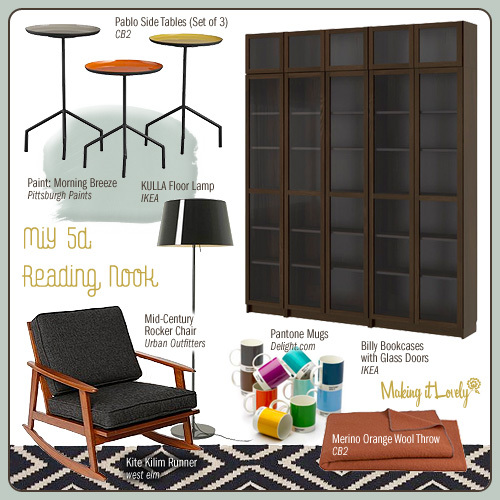 I love the library idea… and those bookcases look great considering they’re from ikea! I really like the looks of the bookcases!!!! Wish I had an Ikea here!!! Love the colour combination – it’s not too masculine or too dark and still manages to look casually sophisticated. That rug! I love it. I love the Billy bookcases. Thinking about replacing my Expedits with white Billys since they are not as deep and much taller. My Expedits are in my blog photo. WDYT? If you are interested I wrote about it on Traveling Tribe and posted some pics. Next time I go I will try to take some more photos!